The lush green and flowery garden with primarily native or drought resistant vegetation covers 25% of the total site area and promotes natural species. There is also a vegetable garden on the roof-top which supplies some fresh organic produce to the kitchen. 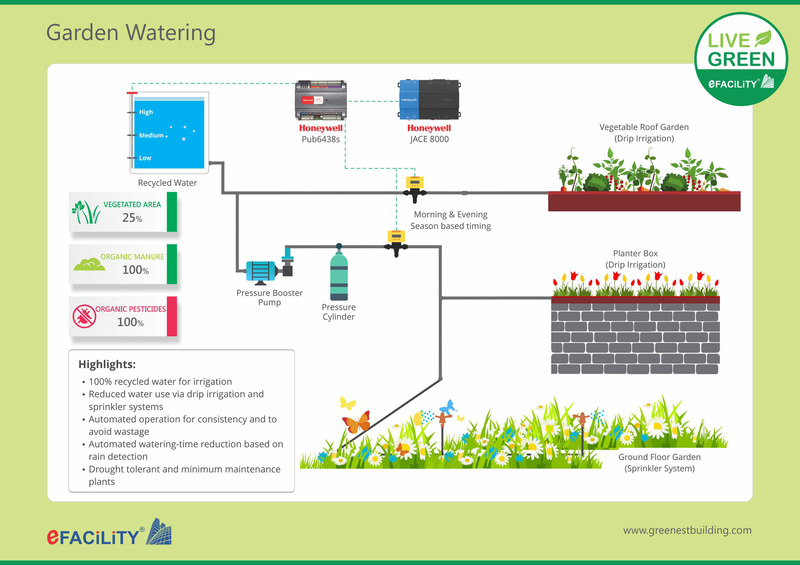 The garden uses the recycled water that is rich in micro-nutrients and watered using sprinklers and drip irrigation systems operated automatically using actuators controlled by the Building Automation System; based on a schedule, to avoid manpower and limit the water usage. The garden also uses only organic manure produced using the in-house waste and natural pesticides. There is also a roof-garden at the facility, where organic vegetables are produced providing fresh & healthy vegetables for the kitchen in addition to keeping the area green and insulating the heat transmission via the roof.